Joseph South(1) 1822-1906 was member of the Primitive Methodist church and continued adherence to the faith after his emigration to New Zealand in 1874. 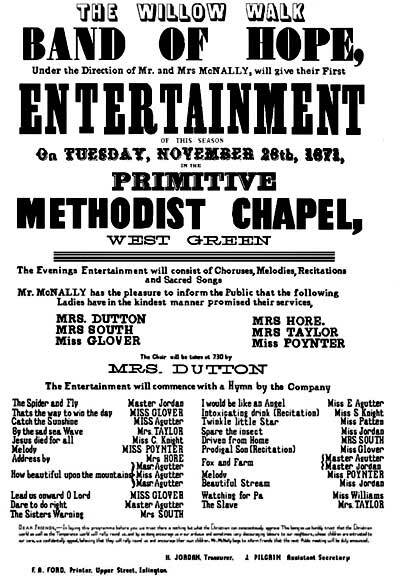 His grandaughter, Judith Cranefield, has provided a photocopy of a bill advertising an "Evenings Entertainment" organised by the Band of Hope and held at the Primitive Methodist Chapel, West Green, Tottenham, on 28 November 1871. It is assumed that Mrs South is his second wife, Mary Ann, and Mrs Dutton, his mother-in-law, Mary Jane Dutton. A transcript of the lower half of the bill, including the delightful titles of the songs and recitations, appears beneath. DEAR FRIENDS,- In laying this programme before you we trust there is nothing but what the Christian can conscientiously approve. This being so we humbly trust that the Christian world as well as the temperance world will rally round us, and by so doing encourage us in our arduous and sometimes very discouraging labours to our neighbours, whose children are entrusted to our care, we confidently appeal, believing that they will rally round us and encourage their own children. Mr McNally begs to inform friends that the next Public meeting will be duly announced. H. JORDON, Treasurer, J. PILGRIM, Assistant Secretary.